Genomic segments that do not code for proteins yet show high conservation among vertebrates have recently been identified by various computational methodologies. We refer to them as ANCORs (ancestral non-coding conserved regions). The frequency of individual ANCORs within the genome, along with their (correlated) inter-species identity scores, helps in assessing the probability that they function in transcription regulation or RNA coding. One of the most exciting recent outcomes of comparative genomics is the realization that when two or more vertebrate genomes are compared via phylogenetic footprinting, numerous highly similar non-coding segments emerge [1–4]. Many acronyms have been proposed for such highly conserved segments (Table 1); here they are referred to as ANCORs (ancestral non-coding conserved regions). Several recent papers address this topic in new ways, and refer to the origin and potential function of such conserved sequences. This article opts for a pronounceable acronym (ANCOR) as a means of facilitating communication. Initially, small-scale analyses comparing human and mouse (or other species) suggested conservation outside coding regions [5, 6]. The identification of such conservation in the vicinity of specific genes (in proximal flanking regions, untranslated regions or UTRs, and introns) helped in the exploration of corresponding regulatory regions. Somewhat broader studies suggested sequence conservation in large sets of orthologous pairs [3, 7, 8]. The advent of full genomic sequences of human  and mouse  allowed the first large-scale analyses not limited to gene-related regions. A comparison between human chromosome 21 and the syntenic region in mouse  revealed a significant number of noncoding conserved elements, many of them far from gene-coding regions . Different reports use not only different nomenclature, but also different definitions in terms of compared species, ANCOR length, and percentage identity. We propose to unite these parameters by using a labeling system that refers to frequency within the genome (Figure 1), a property that follows from any filtering process. Thus, for example, segments defined as being within the top 5% of interspecies conservation  will be denoted here as ANCOR5%, while much more highly conserved 250 base-pair (bp) segments, which have a count of only 256 within 3 × 109 bp of human-rodent sequence , have an incidence of 0.002% and are therefore labeled ANCOR0.002% (see Additional data file 1). Thus, different reports focus on tips of different magnitude of the 'conservation iceberg'. Correspondence between frequency and percentage identity of interspecies alignments. Frequency is seen to be related to ANCOR parameters: for a given species and percentage identity, decreased frequency is observed for longer segments, as expected. Likewise, for a given length and percentage identity, ANCORs will tend to be rarer in a species that is more remote evolutionarily. Pairwise alignments of human versus mouse, chicken and Fugu were analyzed as described  to produce percentage identities for non-overlapping 100 base-pair blocks with maximum 10% gaps. A frequency value associated with a given percentage identity is the fraction of segments with equal or higher percentage identity out of all 100 bp segments of the human genome. This calculation was based on the fraction of such segments out of the total number of blocks analyzed for a given species, scaled by the fraction of the human genome that is aligned to this species: 40%, 2.5% and 1%, for mouse, chicken and Fugu respectively (details are in Additional data files 2 and 3). Dashed lines represent the same analysis for 50 bp blocks. The pairwise alignments were downloaded from the UCSC browser , and relate to the following assemblies: human, May 2004 (hg17); mouse, May 2004 (mm5); chicken, February 2004 (galGal2); and Fugu, August 2002 (fr1). 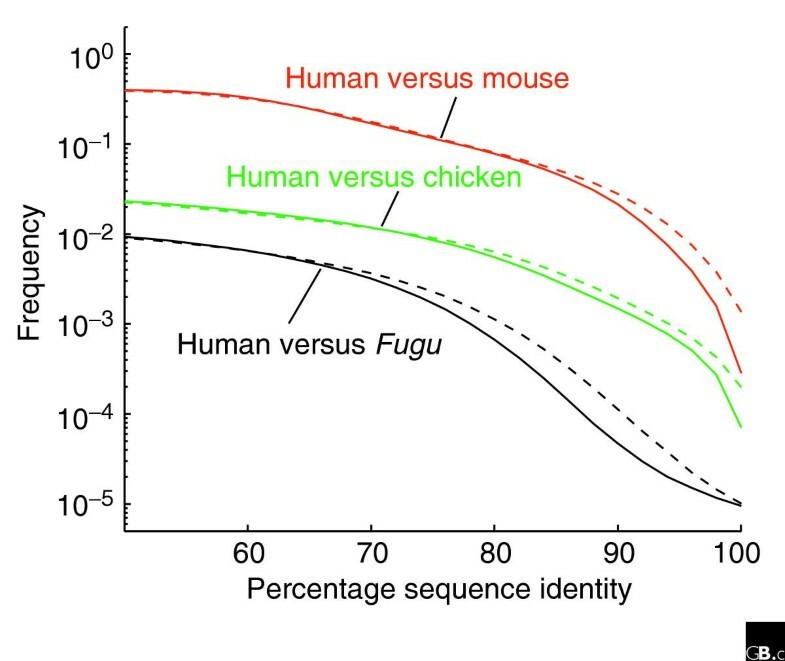 In order to produce a comparable number of aligned blocks when analyzing different species, only human chromosome 17 alignments to mouse were considered, as compared to whole genome alignments in the case of chicken and Fugu. ANCORs of different conservation and frequency are identified by diverse in silico methodologies that aim to identify genomic segments with a high probability of being functional. The first, and most common, is multispecies comparison (Figure 2). These may employ a dozen species or more and look for genomic segments that manifest high similarity in a subset of the species compared. A larger number of compared genomes improves specificity by filtering out sporadic similarity [13, 15], and enhances sensitivity by detecting elements absent from some of the compared species . Often, a scheme is employed to provide more weight to identity between distant species . Interspecies comparison produced by the VISTA server [37, 38], highlighting conserved elements. 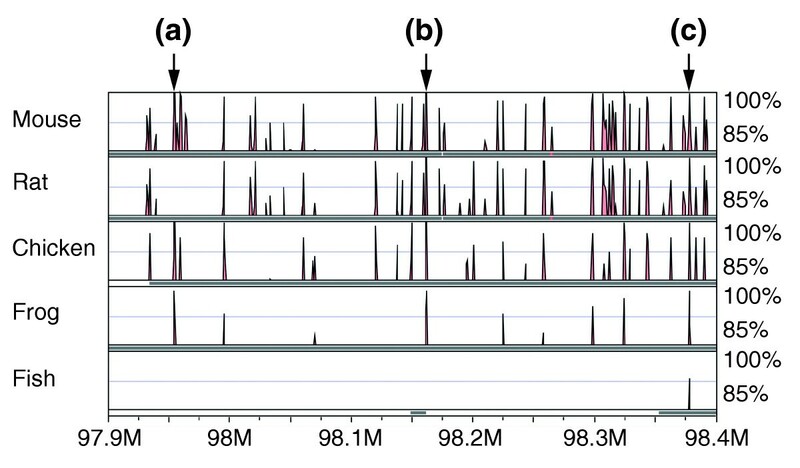 The conservation profiles were obtained with the human sequence as reference (chromosome 6, human genome build 34, megabase coordinates as indicated on the horizontal axis, in an intergenic region). The percentage identity was computed in sliding 100 bp windows by comparison with five different species. Frog is Xenopus tropicalis, and fish is Fugu rubripes. Arrows indicate: (a) an element conserved in mouse, frog and chicken, but not in rat; (b) ultraconserved element uc.196  (221 bp, 100% conserved in mouse and rat); (c) an element conserved in all five species down to fish. The somewhat arbitrary conservation relationships (for example, a segment highly conserved between human and frog but not found in rat) is indicative of a stochastic process, in line with notions embodied in Figures 4 and 5. A second approach relies on distant vertebrate comparison and is thus an extension of species comparison. An evolutionary distance of more than 300 million years will result in two orthologs drifting to a similarity level like that of unrelated sequences (around 30%), unless selection is at work . Any human sequence that can reliably be aligned to chicken or fish sequence, therefore, strongly suggests functional constraints. The chicken genome (around 300 million years divergence from human) was proposed years ago as the best candidate for identifying human ANCORs , but only recently has the full genome sequencing of this species been accomplished . The consequent interspecies comparison shows that about 2.5% of the human genome can be reliably aligned to a chicken sequence. This portion is predicted as functional with high specificity, supported by the fact that more than half of it is among the 5% most conserved between human and rodents . However, a sensitivity reduction is reflected by a low representation of known human regulatory elements (30% are conserved in chicken, as compared to 60% in mouse). This is in accordance with a previous multispecies comparison  that noted the effectiveness of the chicken genome in comparative analyses but indicated its limited sensitivity for detecting functional non-coding elements. The most distant complete vertebrate genome available for comparison with the human is that of the pufferfish Fugu rubripes . Here, the number of detectable non-coding conserved elements is dramatically reduced  but the likelihood that they are functional improves as well, as a result of 450 million years of divergence. The Fugu comparative study identified approximately 1,400 ANCOR0.01% segments genome-wide (typical length of 200 bp and average identity of 84%). These are greatly conserved in chicken and rodents (average identity of 96-97% with human sequences). A third protocol is pinpointing the tip of the conservation iceberg in a comparison between human and a relatively close species, such as rodent. As an example, a recent study  presents a unique set of predicted functional elements identified by a stringent similarity criterion. A set of 256 'ultraconserved' non-exonic segments of absolute (100%) identity, each longer than 200 bp, was identified in a human-mouse-rat comparison. These may be labeled as ANCOR0.002%, constituting the rarest ANCOR thus far defined. A majority of these are also highly conserved in dog, chicken and fish (Figure 3). The detailed comparison with the chicken genome has in fact expanded the set of ultraconserved elements . Some of the elements are common to both chicken and rodents, yet even those that are fully conserved only in one of these species are considerably conserved in the other. Overlap between different ANCOR sets. The quantitative relations are illustrative. The highlighted square zooms in on rare ANCORs, which are predicted to be functional. Ro, top 5% of conserved elements in a human-rodent comparison; Ch, the approximately 2.5% of the human genome that can be reliably aligned with chicken ; Func, the 5% portion of the human genome estimated to be functional on the basis of rodent comparisons [10, 15]. 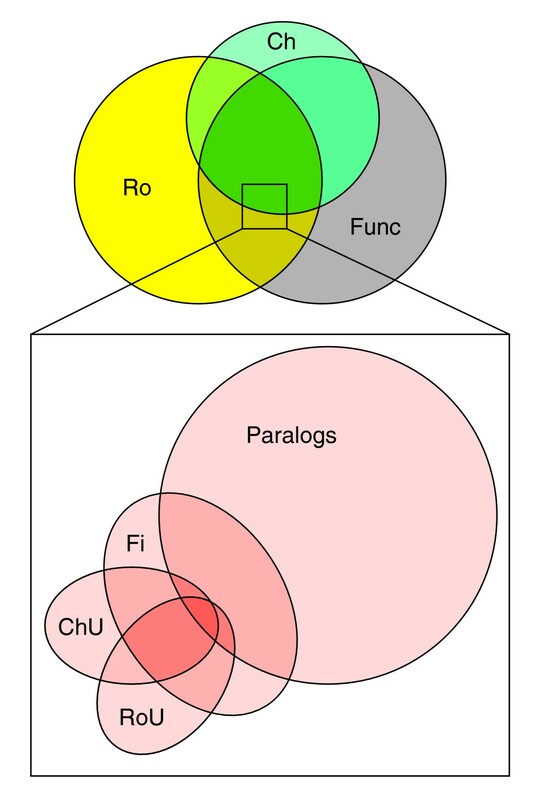 Paralogs, noncoding sequences which belong to paralogous families within human genome ; Fi, elements conserved in the pufferfish Fugu rubripes genome ; RoU, ultraconserved elements, defined as > 200 bp of 100% identity between human, mouse and rat ; ChU, the same definition for ultraconserved elements applied to human-chicken comparison . A fourth property used for functional element identification is hierarchical organization into a family-like structure within a reference species. A paper utilizing this approach  has demonstrated that while the vast majority of the top 5% of conserved elements between human and rodents are unique (singletons) in the human genome, a small number (4%) of these elements form intra-human paralogous clusters containing from two to around 1,000 members. The implication is that belonging to such a paralogous group enhances the probability of function. Statistically, these elements have a frequency of 0.1% in the genome (ANCOR0.1%), but the independent parameter of paralogy adds a new dimension to the functional pursuit. It should be stressed, though, that the resulting subset is not necessarily the most conserved 0.1%. The ANCORs discovered by the methods described above can be examined for potential function on the basis of an array of attributes, such as overlap with expressed sequence tags (ESTs), inferred transcribed RNA structure, and location in the vicinity of exons [13, 21]. Some studies explore conservation-independent parameters, such as the potential for being nuclear matrix/scaffold attachment regions , which have subsequently been shown to be correlated with inter-species conservation . Sometimes, a conjunction of both interspecies comparisons and conservation-independent criteria are used, as exemplified by a study that offers an improved definition of transcription factor binding sites . Given that, in general, not all functional elements are highly conserved, and vice versa, direct prediction of functional properties serves as a powerful complement to the comparative methods described. The resulting sets of ANCORs obtained by the five methods are partially overlapping, as may be expected (Figure 3). Moreover, in some cases overlap may be limited to a shared subset of ANCORs identified by the different methods. Thus, assessing the exact relationships among the sets requires careful scrutiny. ANCORs are dispersed throughout the genome. They are located in 'gene territories': transcribed 3' UTRs, 5' UTRs or introns, as well as gene-proximal upstream and downstream non-transcribed regions. In the latter case they are more likely to serve as cis-regulatory elements. But they are also found outside such territories, in regions remote from any genes. In general, interspecies conservation decreases with increasing distance from coding exons [8, 25], implying that gene territories should be enriched in ANCORs. Indeed, a significant ANCOR5% enrichment has been reported for introns as compared to intergenic regions in the human CFTR region (encoding the cystic fibrosis transmembrane regulator) . In contrast, whole-genome perspectives have identified a negative correlation between the number of ANCORs and the number of coding sequences within genomic intervals [18, 26, 27]. This is also corroborated by the observation that one third of the rare ANCOR0.002% elements are located in 'gene deserts', more than 100 kb away from any gene. Another feature of nonrandom genomic distribution is a tendency of ANCORs to appear in clusters [18, 20]. In parallel, ANCORs are reported to be enriched in gene deserts whose flanking genes are associated with transcription regulation, DNA binding, or development [14, 18, 20, 28]. The latter result points to a likelihood that ANCORs serve as distal cis-regulatory elements, potentially involved specifically in vertebrate development [14, 20]. Because of the conjectural aspects of ANCOR functionality, experimental evidence is extremely important for their validation. It is of course inherently impossible to prove that an ANCOR is non-functional, given the vast spectrum of potential ensuing phenotypes. One of the most obvious proposed ANCOR functions is transcription regulation. Accordingly, one of the earliest relevant studies has demonstrated that approximately the top 20% of mouse-human conserved segments (ANCOR20%) contain a statistically significant twofold excess of experimentally verified upstream transcription factor binding sites . Similarly, the set of ANCOR5% in the CFTR region overlaps with 63% of the functionally validated regulatory elements . In an experimental comparative study, multispecies mammalian sequence conservation was identified by DNA hybridization to human arrayed sequences in a 365 kb interval surrounding the single-minded (SIM2) gene . Seven of eight ANCOR10% segments, conserved in between two and six species, showed nuclear-protein-binding activity, compared with none of six non-conserved segments. In another study of two mouse segments of gene deserts around 1 Mb in length, functional validation was carried out by genomic deletions . Intriguingly, the manipulated animals were found to have no detectable phenotype, despite the fact that the deleted regions had a typical distribution of low-frequency ANCORs (Figure 4), and that they contained 15 ANCOR0.3% elements (typical length 400 bp and human-mouse identity score > 90%). These elements were assayed for an enhancer activity by a transgenic embryo assay, but only one was active. This could indicate that deleting segments with ANCORs of yet lower frequency may be necessary to observe a profound phenotype. Similarity distribution within three different genomic regions. Percentage identity was calculated as described in Figure 1 for non-overlapping 50 bp blocks of human-mouse alignments. The frequency of blocks with a given identity level was calculated out of all blocks analyzed in a specified genomic region. The genomic regions are: the complete human chromosome 21; the human orthologous regions of two mouse gene deserts, MMU3 and MMU19 ; full upstream and downstream intergenic regions flanking DACH1 gene . Blocks of 100% identity consist of around 1.5% of the DACH1-flanking DNA, whereas their fraction is only 0.1% within the two other regions. 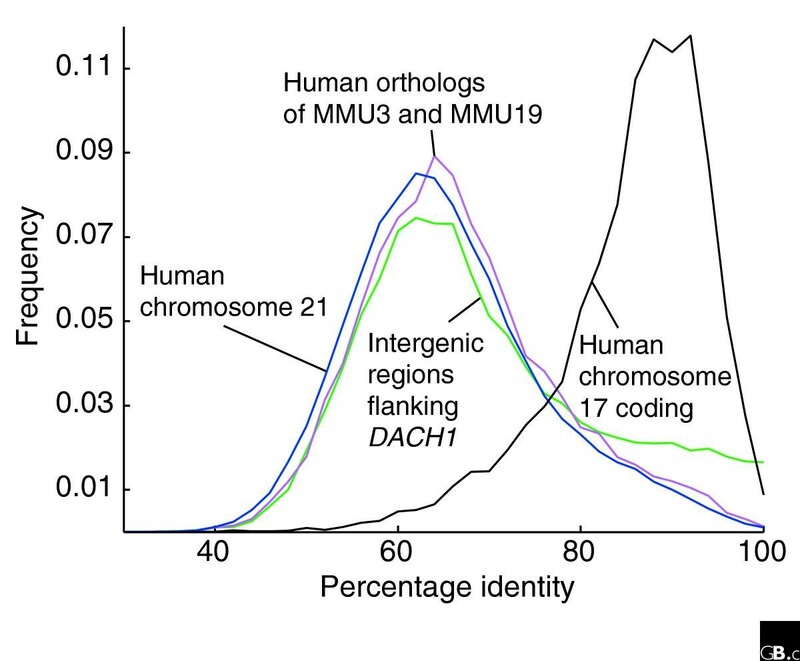 For comparison, the distribution of identity values for coding segments in human chromosome 17 (selected to obtain adequate statistics) is shown, with an intermediate level fraction of 0.8% of the blocks of 100% identity. The latter distribution is seen to be similar to the computed distribution for functional regions depicted in Figure 5. The coordinates of coding exons were extracted using UCSC Table Browser > from the primary table 'refGene'. Genomic coordinates of the selected regions and statistical properties of the distributions are given in Additional files 4 and 5. A corroboration for this notion is found in numerous functional assessments of ANCORs revealed by human-fish comparison (see [28, 31] for reviews). In one example , two gene deserts, flanking the human dachshund homolog 1 (DACH1) gene, were subjected to amphibian and fish comparisons. This appears to be a rather atypical region in terms of ANCOR content (Figure 4), having a strongly elevated incidence of highly conserved segments. Of nine conserved elements identified, seven displayed in vivo enhancer activity in transgenic mice. Similarly, when ANCOR0.01% segments were identified by human-Fugu whole-genome comparison, a functionality rate of 23 out of 25 ANCORs (> 90%) was observed by an enhancer assay, based on a transient co-injection of each element with a promoter-reporter gene construct . The general conclusion is that only the top few hundred ANCORs (at incidence levels of < 0.01%) have a high probability of being functional. Alternatively, it is also possible that the function of this fraction of ANCORs is more obvious and can be tested using conventional experimental protocols, but the function of the remainder is more subtle. Two remote mammalian genomes, such as human and mouse, typically show a bell-shaped distribution of segmental DNA sequence identity (Figure 4), and this is true for diverse genomic element types, such as introns, exons and UTRs, each being characterized by different average percentage identity . Whereas the mean identity is 67% for ancestral repeats, believed to evolve neutrally, the mean identity can be as high as 85% for functional coding segments (exons) that evolve under purifying selection (Figure 5a). A clear challenge for ANCOR elucidation is attempting to infer a sequence-identity distribution for functional segments of non-coding DNA. This is not a straightforward task, because of the current paucity of prediction and annotation tools. Inferred human-mouse similarity distributions for aligned genomic blocks. (a) Standard normal distributions were calculated as an estimation of human-mouse similarity in the neutral genomic fraction (solid), and in the selected genomic fraction (dashed), assuming a mean percentage identity of 66.7% and 84.7% respectively. The graphs represent analyses for different block sizes: 50 bp, 100 bp, and 200 bp. Calculations are based on the normal approximation to binomial distribution with n = block size and p = mean percentage identity. This provides the probability distribution of the number of matches in a pairwise alignment of length n. Each alignment position is considered an independent Bernoulli trial, where p is the probability for an identical nucleotide in the two aligned sequences. All frequencies are normalized to a sum of 1, with the selected population being 1/8 of the total. Compare to [10, 39] for whole-genome analysis of actual data, and to Figure 4 for specified genomic regions. Note that the standard deviation of real data is larger than that computed for the binomial model with independent sequence positions. In addition, while the model assumes a fixed probability for nucleotide identity (p), the real substitution rate varies locally across the genome. (b) Logarithmic transform of the distributions presented in (a). The frequency of 100% identical 100 bp blocks is 10-12 for the neutral portion, and approximately 2 × 10-6 for the selected portion. Given that around 1.2 × 109 bases are aligned (1.2 × 107 blocks), about 20 blocks are expected to be of 100% identity among the selected DNA segments, and much fewer than one (10-5) of the neutral ones. These values are a lower bound for the actual number of such blocks in the genome, because they relate to non-overlapping windows. We propose a parsimony-based conjecture, namely that functional non-coding segments (Figure 5a) manifest a sequence-similarity distribution similar to that of coding exons (Figure 4). This is based on the observation that the number of ultraconserved segments is comparable in coding and non-coding regions , and on the notion that selective constraints are not expected to be vastly different for the two types of functional segments. In both, different elements are expected to be under varied stringencies of selection, yielding a normal-like distribution. It may be computed that nonfunctional blocks of 100 bp with total identity (100%) are too rare to appear even once in the entire mammalian genome when neutral DNA is concerned, while a few dozen such elements are expected within the selected fraction (Figure 5b). Importantly, this very crude model predicts an appreciable number of instances of perfect identity, without assuming a distinguished population of hyper-selected or hypo-mutable DNA elements. Nevertheless, in reality there is an excess of perfect identity regions  (Figure 4), suggesting a further contribution of selective pressure. According to this model, and as corroborated by assertions in the literature , mere knowledge of interspecies sequence identity is a rather weak predictor of functional importance. For example, according to the computed curves shown in Figure 5b, a sequence identity level of around 80% is associated with an equal probability of being functional or nonfunctional. On the other hand, it is expected that sequence identity criteria will continue to be a key method for identifying functional noncoding DNA. Thus, focusing on ultraconserved segments - ANCORs with identity scores near 100% and/or frequency of < 0.01% - will be instrumental, their status more clearly implying an association with function. The definition of a gene is far from straightforward . It is widely accepted that genomic segments that are transcribed into functional RNAs but do not code for proteins may be regarded as genes. This includes genes for, among others, microRNAs that fulfill central roles in gene regulatory networks [34, 35]. Many ANCORs may belong to existing categories of RNA-coding genes, or may be related to gene-proximal control elements that can safely be defined as parts of existing protein-coding genes. But the broader conservation picture that emerges, as described in this review, suggests the existence of highly conserved segments far away from other genes. Some of these have already been submitted to the EMBL database with gene-like annotations . Future scrutiny will help decide whether these genomic objects may be legitimately regarded as new classes of bona fide genes. The following additional data files are available with the online version of this article: Additional data file 1 listing reported sets of noncoding conserved elements, and calculation of their frequency values; Additional data file 2 detailing the statistical properties of similarity distributions used to produce Figure 1; Additional data file 3 providing the raw data of percentage identity versus frequency as presented in Figure 1; Additional data file 4 giving the genomic coordinates of the DNA segments analyzed in Figure 4; and Additional data file 5 detailing the statistical properties of the similarity distributions presented in Figure 4. D.L holds the Ralph and Lois Chair in Human Genetics. This research was supported by the Crown Human Genome Center, and by an Israel Ministry of Science and Technology grant to the National Knowledge Center in Genomics.